Facility in Arkansas at 7:29 a.m. and is on his way to a community living facility. The name of the facility will not be released until after his arrival. The Atlanta rapper has been serving time for a probation violation stemming for his arrest in Los Angeles on drug charges last year. The King has already taken to Twitterto announce his return. "Feels great to be back where I belong...Back in the arms of those who need me the most," he tweeted from his verified @Tip account. "The storm is over & da sun back out. IT'S OUR TIME TO SHINE SHAWTY!!!!! Welcome to the beginning of our Happy Ending!!!!" 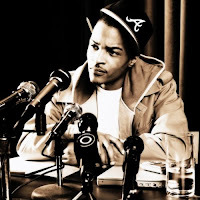 Fans will be getting an intimate look at T.I. 's return to freedom in December thanks to a new show with VH1. In the still untitled series, viewers will get a behind-the-scenes look at T.I., and his wife Tameka 'Tiny' Harris, as he tries to walk the straight and narrow and stay out of prison for good. The series is set to premiere on December 5 at 10 p.m. Previously, T.I. had a reality series titled "T.I. 's Road to Redemption" that ran in 2009 on MTV. The show followed the MC providing guidance to teenagers on destructive paths as he himself prepared to serve a year-long sentence for felony gun charges.